Local alternative rock band Trampoline released their first full-length album, Happy Crimes, on Feb. 9. 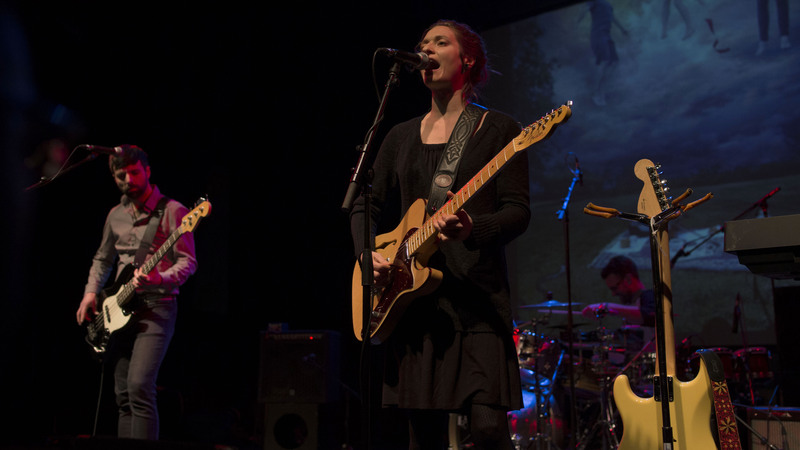 The band is comprised of Michelle Lecnik on guitar and lead vocals, Steve Martens on drums and Joey Penner on bass. While the band has been around since 2014, Happy Crimes is vastly different from their previous work. The male protagonist has ambiguous political affiliations, deals with his past traumas, questions his religious beliefs and struggles with the pressures of the modern world. He discovers that despite his powerlessness, he is able to create change within himself. Lecnik’s life served as inspiration for the protagonist of the album. “I was raised very very religious, like fundamentalist Christian, and the pleasures that one can experience in this life in their human form were very frowned upon and shamed,” said Lecnik. The title of the album came from how pleasure was sometimes criminalized during her childhood. The protagonist is “struggling with the tension of being a good Christian, being a faithful servant of God, but also enjoying life in the human form,” said Lecnik. Martens elaborated that the protagonist is also an amalgamation of lots of people’s lives. “I can hear her story in the character and I can hear other people’s stories in the character,” said Martens. From real-life encounters to social-media rants, the band drew from a variety of sources to try to include different voices within one character. The pervasiveness of social media in the modern world plays a part in the character’s anxieties, as well as online activism. “What do you speak out on and what do you not speak out on?” said Martens. The constant influx of negative news and millions of simultaneous arguments weighs heavily on the album’s protagonist. Lecnik did not set out to make an apocalypse-themed concept album when she was writing tracks. “The plot sort of developed organically and then we had the pile of songs that we wanted to include on the album because they all had overlapping themes,” she said. “There’s a lot that’s not premeditated in this band, things just happen so organically and then we just realize what we have,” said Martens. Trampoline based the instrumentals around the plot’s arc, rather than trying to pull from different individual influences. “I’m more inspired by movie soundtracks that are instrumental than I am bands,” said Lecnik. The band focuses on evoking particular emotions rather than integrating specific genre elements into their music. “There’s just a feeling of sound that has to be there,” said Martens. During the process of writing Happy Crimes, the band came up with an idea for a second concept album. “We’re gonna take historical figures and write their stories and have them interact with each other throughout the album, so that’s in the works,” said Lecnik. You can order a Happy Crimes CD by emailing trampolinecontact@gmail.com. The album will be available for streaming and digital download late February.